Akkerman Fortress is a historic fortified complex of the Ottomans in what is now Ukraine. The exact date of erection of the whole fort is not known, but suggests that its construction took two whole centuries. The huge medieval complex has a strategic location - which was built on high rocky shore of the firth of the Dniester river. Powerful Akkerman stands majestically on the right bank of the estuary of the Black Sea, 80 km from Odessa in southwestern Ukraine. Indeed Akkerman Fortress is located in the Ukrainian city of Belgorod today-Bilhorod-Dnistrovskyi, and is sometimes designated with that name. It is assumed that Akkerman was built between 12 and 15 century, before being erected on these steep and rocky shores, here were the ruins of the ancient city of Tira. Among the hypotheses is that Akkerman was originally a commercial plant for trade turnover and trade with Genoa. Today, historians can certainly say that Akkerman Fortress was one of the largest and most powerful structures between 13-15 century, which even today can be seen in pretty good form in the territory of Ukraine. Centuries ago, Akkerman was intended to protect the city and its inhabitants - managed to resist all current attacks of many enemies. Because of the darkness in the early years of building a fortress, and it is still subject to interstate disputes. 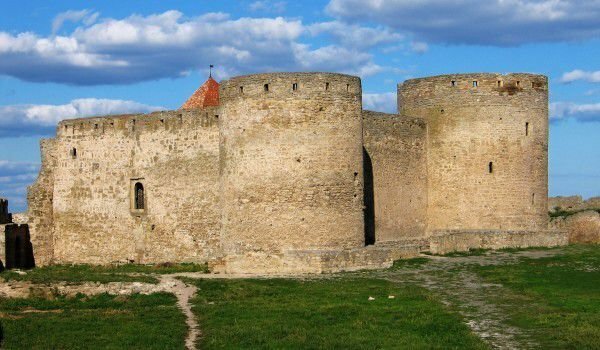 There are opinions that Akkerman Fortress has to be Moldovan, others say it belongs to Turkey, and others have supported the claim that fighting medieval giant was made by the Genoese. As distinguished from disputes over property, it should be noted that whoever built Akkerman, created a miracle of medieval fortress construction. The complex is stable and powerful with fortifications that remain almost intact to this day. Three sides of Akkerman are surrounded and secured by a moat, carved in the rocks surrounding the oval fortress for more than 9 hectares. The length of the fortifications of Akkerman is about 2, 5 km and the height of towers ranging from 5 to 15 m, usually wall thickness reaches a maximum of 5 meters. Medieval architects of the fortress turned it into an absolute safe haven. Akerman was captured only one time in its history with the efforts of the 350-strong army attacking and 100 warships. In 1484 Akkerman Fortress along with her sister - the fortress Kilia, became the latest Black Sea ports, which were conquered by the Turks. So Akkermann became part of the defense system of the Ottoman Empire against Poland, Lithuania, and later against the Russian Empire. Russia captured the town and fortress for the first time in 1770, and finally included them within its borders in 1812 along with the rest of Bessarabia. Today, Akkerman Fortress is a monument of culture. At present the castle is subject to constant archaeological studies to establish its exact history. It is open to visitors, and it is only about a half hour drive from Odessa. Exciting walk in the Akkerman Fortress is provided, and the opportunity to shoot a crossbow, to visit the archaeological museum and exposure to authentic combat equipment and weapons is given. Required to climb a total of 34 stairs where you can enjoy breathtaking views of the firth of the Dniester. Quite often beyond the walls of Akkerman medieval festivals are held where anyone who wishes to become a knight and participate in the symbolic battles can do so.